and when it was bad, it was horrid. This is about the good stuff. You’ll no doubt have your own horrids to tell about, but even those aren’t all loss – they can go onto the compost heap to continue their decay and enrich your soil and nourish your future crops. If like me you’ve have an established kitchen with all sorts of equipment, you probably won’t need to go out and buy any special equipment before you can do this. Be creative – look around your home and see what you already have that you could use or repurpose. If you don’t already have an established kitchen, you may be able to find all sorts of useful things in charity shops / car boot sales. Most of my preserving jars are containers from something we bought or were given, or I bought them very cheaply in charity shops. There’s a whole load of equipment you could go out and buy for fermenting vegetables, but I want to ‘do what you can with what you have’, as much as possible. Then you may find there’s something out there that you’d really like to have and that would make a real difference. If so, go for it. But until then, here’s my way. Incidentally, I was given a beautiful German glazed sauerkraut pot with internal weights by someone on Freegle. I will start using it in earnest eventually, but it is designed for making very large quantities of sauerkraut. I want to perfect my technique before I move into that scale of making. In the meantime, this works for me. Grate or thinly shred whatever vegetable you’re using. This time I shredded a whole (small) white cabbage. I ended up with about 1.75lb of shredded cabbage, once I’d set aside some manky outer leaves and the inner core. To that I added around 0.75 table spoon of sea salt crystals (I’m sure you could use any salt you had). Put it all in a very large bowl, and scrunch it hard with both your hands for a long while, until the cabbage looks translucent and the whole thing is very wet, continuing to mix it around all the time. The aim is to break down the cell walls of all the cabbage, to release the liquid within. This will form lactic acid and allow the fermentation to proceed. I find the action feels very similar to combining flour and fat to a breadcrumb texture when I’m making pastry by hand. But it takes a lot longer than that – I would err on the side of smushing up the cabbage for a longer rather than a shorter time. Keep going, and listen to something interesting on the radio. You might also want to add some additional flavouring – this time I added caraway seeds. As you can see, I’ve absorbed the very technical terminology (scrunching; smushing...). This is of course vital. Once it’s all very wet, transfer it into a glass jar with a tight-fitting lid. I use the kind with a rubber sealing ring and a flip top lid (see photos). You just need something that will seal firmly, but can be easily opened and closed. It also helps if the opening is wide enough to be help you spoon in the mixture and pack it down tight. Pack everything down really tight in the jar, so that there is a covering of a layer of liquid at the top. I push it down with my hands, but this time I also used a spurtle that I happened to spy in the kitchen to pack it down even tighter. 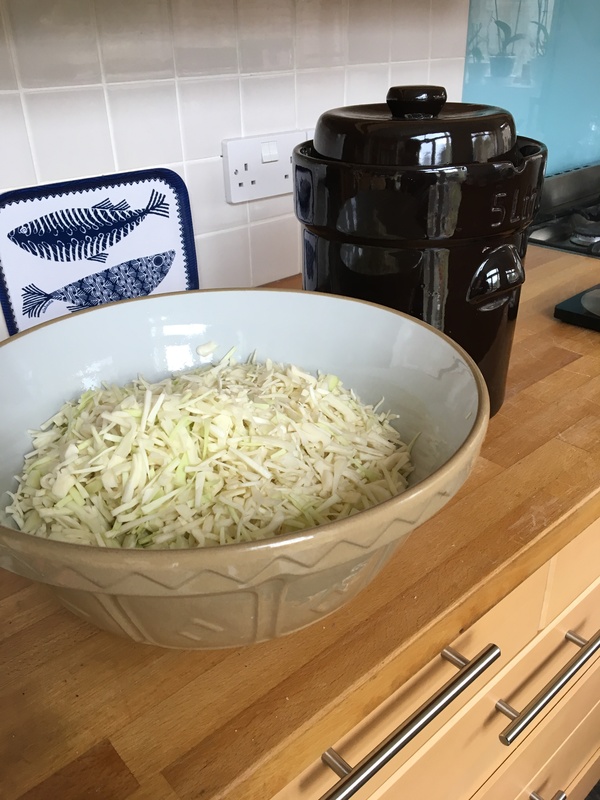 If you have something suitable, use a weight to keep the cabbage down below the liquid – anything heavy and clean that fits inside the jar will do fine. Sometimes I’ve done it without a weight, and mostly that seemed fine too but I think your chance of success will be better with a weight. Don’t over-fill the jar – leave at least a centimetre or so space at the top, to allow for the liquid to bubble as it ferments. Once it’s all in and well packed down, close the lid and label the jar. I like to record the weight of vegetables I began with and the date. Then set the jar aside somewhere out of direct sunshine to stand. But make sure it’s somewhere you won’t forget all about it, because you’ll need to check it every day for the next few days. I always stand the jar on a tray, just in case (as happened this time with the sauerkraut) I’ve over-filled the jar and liquid is bubbling over – you won’t want your kitchen work-top forever smelling of sauerkraut, nor if you’ve used red cabbage or beetroot will you want it stained a startling shade of purple). For the next few days, open it up once or twice each day to allow the gases to escape. Sometimes the books picturesquely call this ‘burping’ the jar. After a while you’ll find you no longer need to do this, and at that point I usually store the jar in our garage, and from time to time transfer some to a smaller jar that I keep in the fridge to eat as part of my daily lunchtime salad or sandwich. 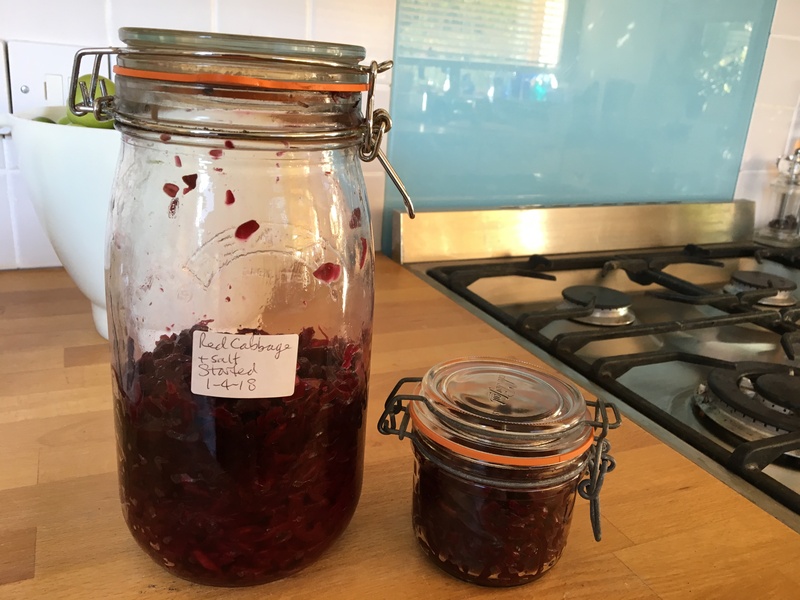 After I made the sauerkraut, I went on to do a smaller jar of mixed grated raw beetroot and carrot. This was much easier to scrunch – the act of grating the veg released quite a bit of liquid and I kneaded the veg for only a fairly short time. I was surprised to see how small a jar two large carrots and two decent sized beetroots fitted into. I haven’t made this before, so it will be interesting to see how it tastes. It will be a while before I can tell you what the results of these jars are. I’ll be back to tell you. In the meantime, I’m still eating my way through a large jar of red cabbage sauerkraut I made in April 2018. It’s delicious. The crunch that was originally in the cabbage has now changed to the softer texture more typical of bought jars of sauerkraut. I happen to like the crunch and enjoy it that way, which it seems to keep for a long time. So. Now it’s your turn to give it a try. I’ll be interested to hear how you get on. Believe me, I’ve had my failures, but so have I had my successes. 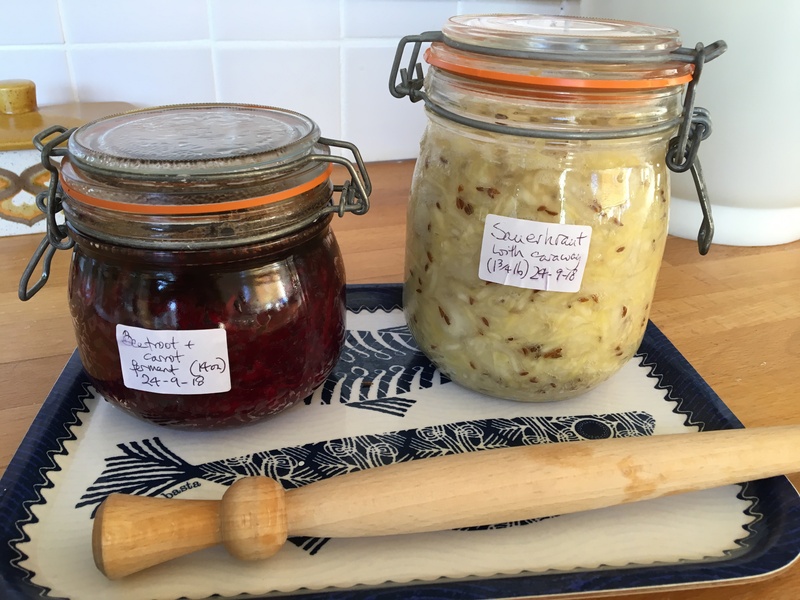 This entry was posted in Do what you can with what you have, Food, Frugal, Local, Local food, Uncategorized and tagged Fermentation, fermented foods, Food, Frugal food, Learning new skills, Sauerkraut, Simplicity. Bookmark the permalink.